Purpose: Ductal carcinoma in situ (DCIS) is associated with an excellent prognosis; historical studies have shown similar levels of psychological distress in patients with DCIS and with early-stage invasive breast cancer (early-IBC). It is suggested that these results might have led to better patient education about prognosis after DCIS. This study reports the current levels of anxiety, depression, and health-related quality of life (HRQoL) in DCIS and early-IBC patients. Methods: DCIS (n = 89) and early-IBC patients, T1-2N0, (n = 361) were selected from the UMBRELLA breast cancer cohort. Patient-reported outcomes were prospectively collected before the start of adjuvant radiotherapy (baseline) and at 3, 6, 12, 18, and 24 months thereafter. Mixed models were used to compare differences in levels of anxiety, depression, and HRQoL between DCIS and early-IBC patients. Results: DCIS and early-IBC patients reported similar levels of anxiety, which were highest at baseline. Depression scores were comparable between groups, also after stratification by use of adjuvant chemotherapy. The proportion of patients reporting high-risk depression scores (i.e., Hospital Anxiety and Depression Sale score >8) was significantly higher among patients with DCIS at 6, 12 and 18 months, and this proportion increased over the first 18 months. Health-related quality of life was comparable between both groups. 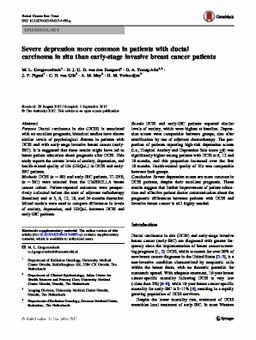 Conclusion: Severe depression scores are more common in DCIS patients, despite their excellent prognosis. These results suggest that further improvement of patient education and effective patient doctor communication about the prognostic differences between patients with DCIS and invasive breast cancer is still highly needed.